I take great pride in offering a comprehensive approach to spinal conditions for my patients and helping them get back to their active lifestyles. Dr. Small is board certified by the American Board of Orthopaedic Surgery and fellowship trained in spine surgery. He has been with Florida Orthopaedic Institute since 1996. 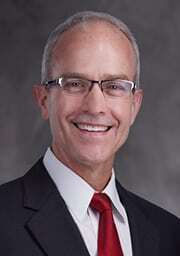 Dr. Small completed his medical education at the University of Nebraska in Omaha. Dr. Small also received a Doctor of Pharmacy Degree from the University of Nebraska. After completing a residency in orthopedic surgery at the University of Texas Southwestern Medical Center in Dallas, he completed a spine fellowship at the renowned Kerlan Jobe Orthopaedic Clinic in Los Angeles, California. Dr. Small has had comprehensive spine training involving the cervical, thoracic, and lumbar spine. His special interest is in sports-related injuries. Dr. Small has completed and maintains ongoing research projects and is a member of the American Academy of Orthopaedic Surgeons. Dr. Small’s practice is approximately 40% cervical spine, 55% lumbar spine, and 5% thoracic spine. He is currently using cage technology for lumbar fusions. He is well versed in endoscopic, microscopic, as well as traditional spine surgery techniques. I was so fortunate to have Dr. Small perform my spine surgery. After five spine surgeries, I now feel marvelous! I am forever grateful to him. Dr. Small is both kind and compassionate. He is an excellent surgeon. The face that he has two PA’s working for him is a tribute to how popular and busy he is every day. Several of the specialists I see also commented about how excellent a doctor I had for my back surgery. My back is pain free now after my surgery! Thank you, Dr. Small! Dr. Small diagnosed my cervical spine issue and, after studying the situation and explaining in detail the suggested surgery, I agreed that surgery was necessary and we proceeded. I can’t say enough good things about the way Dr. Small treated me and my family. He was gracious, kind, courteous and always open to questions. After the surgery and recovery, Dr. Small came to my room to check on me and answer any questions or concerns that I might have had. He is a very caring and true professional. Thank you. Excellent and caring doctor. Took the time to talk about my back issues and listened to me. He is a very thorough doctor and I would highly recommend him to family and friends! After spending two years in a wheelchair due to a fall that fractured a lumbar vertebrae, causing severe leg pain when walking or standing, I can now walk without pain using only a walker. I tried pain injections and nerve ablations with little success. Dr. Small did a spinal fusion surgery on my lumbar spine three months ago and I am no longer in constant pain and can walk standing straight and tall. It is amazing what a difference in my life Dr. Small made. I would highly recommend his services! I had back surgery by Dr. Small in November of 2018 for my sciatica which went all the way down my right leg and into my foot. After trying many things including chiropractors and epidurals, I finally went to Dr. Small. I could not be happier with the results of the surgery! I was in constant pain for about a year and a half prior to doing to Dr. Small. Immediately, after the surgery I felt much better. I was able to go for short walks around our neighborhood the very next day! They said it would take about three months for it to go away completely, which it did. I can now walk around stores or theme parks which I was not able to do prior to the surgery. I’m even able to ride a bicycle again at the age of 71! Thanks so much to Dr. Small and Ann Gowski, ANRP, for all their help. I would highly recommend Dr. Small and this surgery for anyone going through the same pain. Dr. Small is the best around! Caring, compassionate, definitely knowledgeable and confident. I trust his opinion and skills to be the best in the Tampa area. He spends time with you. He explains things thoroughly and answers your questions. 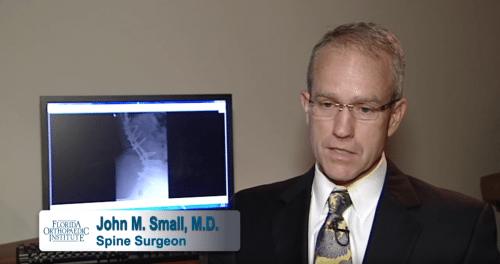 I have been seeing Dr. Small for about 20 years and have had numerous spine surgeries with fusion. I love him. He rates at the very top for me. I have complete confidence in him. He is also very caring and kind. I recommend him often. I was really impressed with Dr. Small and have been raving about him to all my family. Dr. Small has the best bedside manner, and took his time to go over any questions I had. I would definitely recommend him and his staff to anyone with a spine issue. So impressed! Dr. Small has been my spine surgeon since early 2005. Dr. Small has such a way of putting a patient at ease because of his soft-spoken tone and wonderful personality. After surgery, Dr. Small was right there to explain the whole procedure, the fusion he performed on levels L-2 to S-1, and how he repaired and redid the fusion. I knew right then and there that Dr. Small would be my surgeon for life. His professional and personal persona showed his caring was very real. I never met a doctor who cared more for their patients than Dr. Small. His professional team, both staff and assistants, are exceptional as well. They all work together to help you with whatever your needs are. I would highly recommend the entire practice to anyone with spinal needs. Dr. Small is the best! Dr. Small has been my spine surgeon since early 2005. My first surgery with Dr. Small was having to redo a fusion that did not take the first time which was performed by another out of state surgeon. Of course having to go through another surgery was both frightening and worrisome. As soon as I spoke with Dr. Small all those fears vanished and I put my faith in Dr. Small’s expertise. Dr. Small has such a way of putting a patient at ease because of his soft-spoken tone and wonderful personality. After surgery, Dr. Small was right there to explain the whole procedure and fusion he performed on levels L-2 to S-1 and how he repaired and redid the fusion. I knew right then and there that Dr. Small would be my surgeon for life. His professional and personal persona showed his caring was very real. I never met a doctor who cared more for their patients than Dr. Small. His professional team, both staff and assistants, are exceptional as well. They all work together to help you with whatever your needs are. I would highly recommend the entire practice to anyone with spinal needs. Dr. Small is the best! I saw Dr. Small for spondylitis. My pain would only let me sit 2-5 minutes and I had a large numb spot on my leg and burning at my ankles. I had back surgery. It has been 3 1/2 months and I am 100% pain free. I am walking 6 miles 4-5 times a week. I had never imagined that surgery would completely eliminate my pain. Dr. Small is the most personal medical professional I have dealt with as a patient or after working in the medical field for 20 years. I have received the best care one could expect from the staff at FOI. The front desk representative Alishia B is helpful and one of the most professional assistants that I have ever met . I have received the best care one could expect from the staff at Florida Orthopaedic Institute. The front desk representative, Alishia, is one of the most professional and helpful employees I have ever met. Thank you for having the confidence that I was healthy enough for you to operate on my back and make my life normal again. I cannot say enough how wonderful you and your staff are, please say thank you to them. Dr. Small has been my spine surgeon since early 2005. My first surgery with Dr. Small was having to redo a fusion that did not take the first time which was performed by a different out of state surgeon. Of course, having to go through another surgery was both frightening and worrisome. As soon as I spoke with Dr. Small all those fears vanished and I put my faith in Dr. Small’s expertise. Dr. Small has such a way of putting a patient at ease because of his soft-spoken tone and wonderful personality. After surgery, Dr. Small was right there to explain the whole procedure and fusion he performed on levels L-2 to S-1 and how he repaired and redid the fusion. I knew right then and there that Dr. Small would be my surgeon for life. His professional and personal persona showed his caring was very real. I never met a doctor who cared more for their patients than Dr. Small. His professional team, both staff and assistants, are exceptional as well. They all work together to help you with whatever your needs are. I would highly recommend the entire practice to anyone with spinal needs. Dr. Small is the best! Dr. Small’s staff is very a knowledgeable, professional group providing excellent care for patients. They have a wonderful caring attitude with conservative decisions to achieve the best outcomes for their clients. My wife and I are both in the medical profession and select our medical providers through diligent research. When visiting any orthopedic office, patience is key. They typically are delayed with appointment times no matter whose office or doctor. So bring something to read or enjoy people watching and relax. I had requested to get an appointment through Dr. Small’s scheuler as soon as possible due to an issue that had arose and was getting progressively worse on daily and worrying me tremendously. The staff went above and beyond in helping me to be seen by Dr. Small on Wednesday, July 3rd. They had advised me that the second week in July Dr. Small would not be in clinic. They offered to get me in on the same day if I could get to the Telecom office in the late afternoon. The staff had Dr. Small see me as an add on patient at the end of the day. The end of the day on July 3rd! I know this was not a convenient situation for all those who work in Dr. Small’s clinic on the last long day before the July 4th holiday off. However every single person and of course Dr. Small were so kind and accomodating. I can’t thank them all enough for seeing me and answering all my questions and relieving a huge amount of fears. I am so very thankful for all their efforts and caring enough to take the time to see me. I am truly appreciative and forever grateful. Thank you to all! I have been a patient of Dr. John Small for approximately 7 years. Aside from back issues I am an otherwise healthy individual. I underwent my first back procedure (a laminectomy/discectomy in 2008). My second surgery, a lumbar spinal fusion, was performed in mid 2013. I will never be able to thank Dr. Small enough for helping to return my quality of life. At 41 I was facing the inability to ambulate more than a few blocks at a time, becoming rapidly depressed and struggling to accomplish daily tasks. Dr. Small and his team guided me through the surgical process and jumped through hoops to obtain authorization from my insurance carrier for the fusion surgery. Ten months after surgery I am walking up to two miles in a session. I am able to walk my dog again and I walk every weekend with my girlfriends. I could have never done this without Dr. Small. I am forever grateful! The care I received at FOI by Dr. Small and Lori Luna has always been first rate. Their first priority is treating you as a person. They are very compassionate and treat ME, not just my condition. I have been seeing them for almost 10 years and will never trust anyone like I trust them. Could not give a higher recommendation than I do them. Without them, I would not be able to live my life that I am able to now. I am forever grateful! I cannot express all the gratitude that I have for Dr. Small, Lori Luna and Lashanda Cole. This is a remarkable team and they have been absolutely phenomenal and such a blessing in my life. They are responsive, caring and they worked together as a team to get me back on my feet. I am forever grateful for these folks!